One of baseball's most colorful showmen, Bill Veeck integrated the AL when he signed Larry Doby while the Indians' owner. He owned three AL teams - Cleveland, St. Louis, and Chicago. His 1948 Tribe club was the first to top two million in attendance. While the owner of the Browns, he sent midget Eddie Gaedel up to bat, and as the chief of the White Sox, introduced baseball's first exploding scoreboard. Comments: In December, 2004 I picked up a nice Perez-Steele postcard of Veeck. It was eventually submitted to PSA and received a NM-MT 8 rating. The card was a tribute - not an item issued during Veecks career. So, in January 2008 I picked up a raw 1948 Indians team issue picture to replace it. It was more of a photograph, then a card and measured out 8 X 10. I prefer to have standard-sized baseball cards if they exist. 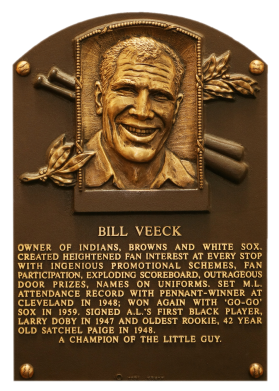 After some research I learned of the 1976 Chicago's Greats set and of the fact Veeck was still an owner during its production. Soon thereafter, I was able to find a complete set on eBay for $8 in February, 2013 and submitted it to PSA. In late May, 2013 I sent PSA a group of 175 raw cards that I had purchased at shows and on eBay over the course of several years for grading/authentication. I waited two plus months for the submission and during that time decided to have a little fun. Normally, I get the email from PSA indicating grades are available and I go online to review the results. When I receive the package I open it up look through the cards and start the scanning process. The entertainment ends there. This time I decided to do things a little differently but it would take extreme discipline. I didn't go online to look at the grades and the package arrived for pickup on August 23, 2013. I asked my wife to open the box and randomly distribute the contents into a large storage bin. The bin went into the closet and each day for the next 6 months my kids would take turns pulling out a card for me. One card at a time, it was like Christmas every day. I'm involved in a private chatroom of sportscard collectors where I would post a picture of "The Card of the Day" for the guys to follow along. The kids loved it too! It was so fun I tagged on two more submissions (one for 15 cards received back in early Dec, 2013 and another 53 card submission returned in Feb, 2014) and lumped them in with the other cards as they came back from PSA. The original 175-day quest has now turned into almost a year-long adventure. This '76 Chicago Greats Veeck card was Day #011 - I was thrilled to add this GEM to the collection. 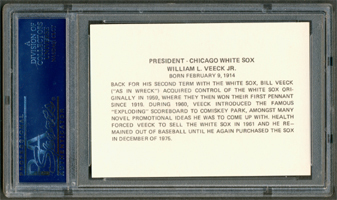 Description: Former stars of the Cubs and White Sox are featured in this collectors issue produced in conjunction with an early sports card and memorabilia show in Chicago. 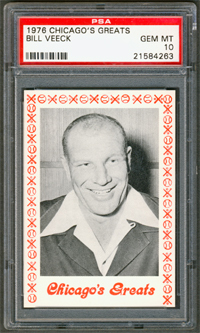 The 2-1/2" X 3-1/2" cards feature black-and-white action photos at center of most cards, with a portrait inset at top. Graphics around the front are in red. Backs have detailed career summaries. A starting team, manager and president for each of the Chicago teams is represented in the issue. Complete sets were originally sold for about $2 with uncut sheets sold for $6.